Improving skin color and texture is an important goal for many of our patients, including those who cannot afford to have much down time after a laser procedure. But, can one laser really improve both skin discoloration and texture with minimal down time? The answer is YES and the treatment is called PicoToning. With the specialized Focus Array setting on the PicoSure laser, one device can target multiple cosmetic concerns utilizing gentle pressure on a cellular level. This treatment improves the appearance of sun damage and brown age spots by breaking up pigment. At the same time, the treatment improves the texture and tone of the skin by stimulating collagen production. That’s why PicoToning is also effective in the treatment of fine lines and helps to smooth divots and depressions. It is safe in many skin types and may also be an excellent choice for people who simply feel as if their skin has lost its luster. Can PicoToning be used for melasma? Yes, PicoToning offers another tool in our dermatologists’ arsenal for the improvement of melasma. Melasma is one of the most difficult problems that dermatologists encounter in their patients. It is a skin condition that causes discolored brown patches, usually on the face, that worsen with sun exposure. It is also frequently seen in pregnancy. We often start treatment protocols with topical brighteners and bleaching creams, but for many patients this does not lead to sufficient improvement. Because PicoToning is gentle on the skin, there is less risk of exacerbating melasma compared to some other laser treatments. Is PicoToning effective for acne scarring? Yes, the PicoSure laser with Focus Lens Array is FDA-approved for the treatment of acne scarring. At least one study demonstrated a >24% improvement in acne scar volume after a series of treatments. PicoToning may be a good treatment option for mild to moderate acne scarring in patients who are looking for minimal down time or have darker skin types. Following a comfortable, 15-20 minute PicoToning treatment, the skin remains pink only for up to 1-2 days, allowing patients to return to their regular activities quickly. Best results are seen after a series of 3-6 sessions. 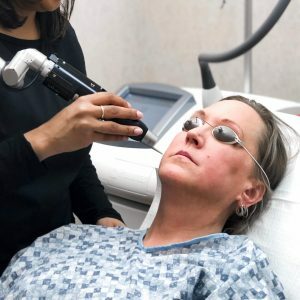 PicoToning is uniquely suited for individuals with busy schedules who still want to look their best by simultaneously improving brown spots, skin texture and stubborn acne scars. PicoToning has multiple applications due to its benefit for both skin color and texture. SkinCare Physicians’ dermatologists are excited with the results they have had with the procedure. To find out if PicoToning is right for you, schedule a consultation with one of our physicians near Boston.